Garrick started working on animal models applied to sheep and goats in 1982 (the year I was born ☺). In the old system, each breed has their own data silo. This is combined together to have a joint pedigree and performance data. EPDs are determined by the collective action of many genes. Selection increases the frequency of favorable gene effects and decreases the frequency of unfavorable gene effects. 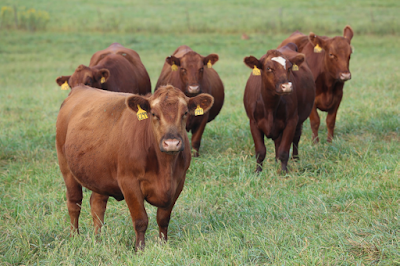 This allows producers to breed better cattle year after year. 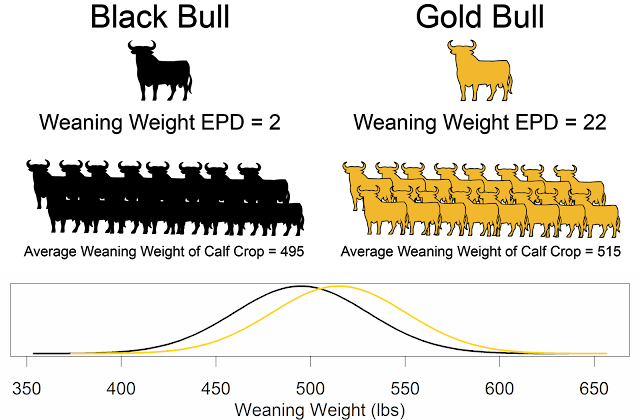 Genomics allows us to increase the accuracy of genetic prediction, especially for young animals with little or no data. In human medicine, researchers are looking for individual DNA variants that are predictive of a person's risk for developing a disease. In beef cattle genomics, we don't use this conservative approach; we use all of the DNA variants simultaneously. Using all of the DNA variants gives much better predictions. The hoped outcome is data to information to knowledge. The genetic prediction methods really can be a black box for producers. Right now, the major problem is merging the data from the multiple breed associations and doing so in a repeatable and efficient manner. The Irish Cattle Breeding Federation has negotiated a deal that they can genotype an animal for $20, because they bought 1,000,000 SNP assays at once (a bulk deal). United States breed associations need to consider more stringent DNA testing requirements, such as genotyping all parents, which would lead to bulk deals. The purpose of collecting pedigree, performance and genomic data is to make better selection decisions. The information systems used to input, store, and analyze data need ongoing development.